Truman State University announces the appointment of Troy D. Paino as provost and vice president for academic affairs, effective July 1, 2008. Paino was selected for the position after a national search. Paino currently serves as the dean of the college of liberal arts at Winona State University, a position he has held since 2004. Paino began his career at Winona State University in 1997 as an assistant professor of history. He served as director of the paralegal program from 1997-2004, co-founder and director of the law and society program from 1999-2004, and interim dean of the Darrell W. Krueger Library from 2005-2006. He was promoted to the rank of professor in 2007. Paino’s educational background includes a Bachelor of Arts degree in history and philosophy from Evangel University in Springfield, Mo., a juris doctorate from Indiana University School of Law, and a Master of Arts and Doctor of Philosophy, both in American Studies, from Michigan State University. Prior to arriving at Winona, Paino worked as a partner in the law firm of Bookwalter & Thomas in Indianapolis, Ind., from 1988-1991, and subsequently served as a teaching assistant and then instructor at Michigan State University from 1992-1997. In the community, Paino works with the Board of the Great River Shakespeare Festival that helps raise $500,000 annually to sustain the festival. He also serves on the Board of Directors for Lakeview Manor, Inc. and Summit Place West and the Winona Area Tennis Association. Regina Myers Morin will become Truman State University’s new associate vice president for enrollment management, effective Jan. 17, 2008. Morin, who was selected after a national search, is a graduate of Truman State University, where she received her Master of Arts and Bachelor of Science in Education degrees. 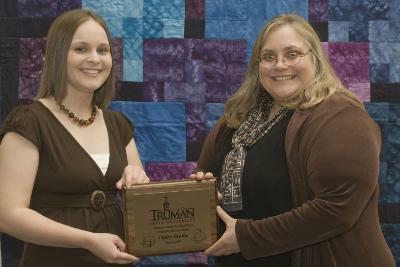 Morin began her career in the field of admission at Truman State University. She spent a total of 13 years serving first as an admission counselor, then an assistant director of admission, and finally the associate director of admission. From October 1994 to May 1997, Morin served as the director of transfer enrollment at Simpson College in Indianola, Iowa. Most recently, Morin has had a very successful career as director of admissions at Columbia College in Columbia, Mo., where she has served since May 1997. Morin has served three terms on the Missouri ACT Council and is currently chair-elect. She is also involved in the ACT State Organization, American Association of Collegiate Registrars and Admission Officers, Missouri Association of Collegiate Registrars and Admission Officers, Missouri Association of College Admission Counselors and Missouri ACE Network. She is a frequent presenter at state and national conferences and is a member of the Institute for International Education, National Association for Graduate Admission Professionals, Overseas Association for College Admission Counseling and the National Association for College Admission Counseling. KKTR, the Truman NPR affiliate broadcasting on the FM dial at 89.7, will be off the air today and possibly for the next three days while radio engineers change out the existing transmitter with a state of the art HD (Hybrid Digital) transmission system. Once KKTR returns to regular broadcasting, listeners will continue to receive NPR programming on their existing radios; however, in order to listen to the digital transmission, a special receiver is required. For more information about high definition radio, you can go to http://www.kbia.org/inside/faq/hd_radio.htm. The advantages of digital include the enhanced audio quality and the ability to receive multiple channels of NPR programming. More information on those new channels is forthcoming. The KKTR digital conversion is possible, in part, through a $78,000 grant from the Corporation for Public Broadcasting. In addition, Truman’s student station KTRM (88.7), is in line for a similar digital makeover. Barring no unforeseen engineering problems, KTRM hopes to return to regular broadcasting next week. KKTR and KTRM will be the first stations in northeast Missouri to broadcast digital signals. Ray Miller Elementary School students (front row, left to right) Colin Terrell, Bobby Campbell and Cole Archer display donated books with (back row, left to right) Teresa Heckert, Lauren Caffey and Janet Gooch. The elementary students participated in a book drive for Truman’s Speech and Hearing Clinic. Teresa Heckert, professor of psychology and president of the Truman State University chapter of the Honor Society of Phi Kappa Phi; Lauren Caffey, a communication disorders graduate student and Phi Kappa Phi member; and Janet Gooch, communication disorders department chair and Phi Kappa Phi member; received more than 100 books from students at Ray Miller Elementary (RME) School. RME students participated in a book drive sponsored by Phi Kappa Phi and the Communications Disorders Association (CoDA) to collect books for the Truman State University Speech and Hearing Clinic. 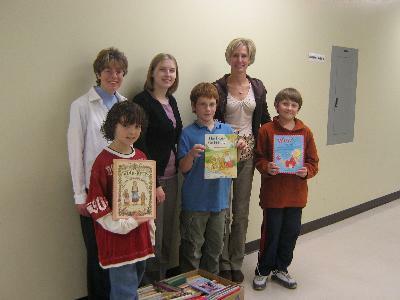 More than 1,400 books were collected as a result of the drive. Claire Grothe (left) receives the Director’s Award for Excellence in Interdisciplinary Research from Sara Orel, professor of art, recently in Ophelia Parrish. Claire Grothe, a senior history major from St. Louis, Mo., received the Director’s Award for Excellence in Interdisciplinary Research for the spring 2007 semester. The title of the award-winning paper is “From Glory to Devastation: Artistic Depictions of Nasser’s Egypt, 1952-1974”. Grothe wrote the paper in her Cultural Crossroads: Cairo JINS class, taught by Sara Orel, professor of art. The paper details the changing attitudes of the artistic community toward the Nasser regime. Grothe is the daughter of Jim and Beth Grothe. She is currently a member of Phi Kappa Phi, Phi Alpha Theta and the Truman State University Historical Society. Grothe also volunteers at the Still National Osteopathic Museum at A.T. Still University. The student artists of ART 315 are pleased to extend an invitation to “Phantasmagoria,” an exhibition of artwork at Il Spazio. These pieces were created to explore modernized mythologies, the fantastical in the every day and conceptual responses to the idea of fairy tales in contemporary life. What distinguishes a fairy tale from any other narrative? What are the hallmarks of our modern age? Can cynicism coexist with the suspension of disbelief? And how can these ideas translate into visual art? An afternoon reception will take place from 3:30-5:30 p.m. Dec. 10 in Il Spazio’s back room to see how the artists of ART 315 respond to these questions. The exhibit will be open during normal business hours at Il Spazio, 215 W. Washington St., until Jan. 14. For additional information, please contact Emily Booth, assistant professor of art and University Art Gallery director, at ebooth@truman.edu. DeLaval Manufacturing’s Research and Development Department in Kansas City, Mo., is seeking a student to be a winter intern for a full-time, temporary position, beginning Jan. 15, lasting a minimum of three months and a maximum of six months. DeLaval is a leading global supplier of formulated detergents, sanitizers and topical disinfectants. The position will include performing design of experiments and laboratory experiments to work on specific product development projects with senior scientists of the R&D department. This would be a great learning opportunity in various aspects of product development in an industrial setting. The position would also include helping develop an understanding of solving scientific problems leading to commercial products. Salary would vary depending on skills and experience. Qualifications /skills that would be required for this position include having the ability to communicate effectively, both orally and in writing, having completed two years of chemistry toward a degree in chemistry, having basic chemistry and mathematical skills to work in the chemistry laboratory performing wet experiments, having the ability to use Microsoft Office or equivalent software such as spreadsheets, presentations and work processing applications, having the ability to implement, plan and critically evaluate research, having the ability to review, understand and interpret a variety of technical data and having the ability to work effectively with a diverse range of professionals. If you are interested in this position, send a cover letter and résumé to gurusamy.manivannan@delaval.com. For more information about DeLaval, visit http://www.delaval.com or http://www.westagro.com. The Alumnae Panhellenic Association of Greater Kansas City is offering educational grants and interest free loans, to female college senior or graduate students, who are residents of the greater Kansas City area, attending Kansas or Missouri schools. The Kansas City area is defined as Cass, Clay, Jackson, Platte, and Ray counties in Missouri and Johnson, Leavenworth, Miami and Wyandotte counties in Kansas. Applicants must be a senior or graduate level student at the beginning of the next academic year, with at least a 3.0 grade point average. Sorority membership is not required to apply for this program. To be considered for a grant or loan, a completed application form, all required supporting material, and a letter of reference must be on file with the Grants and Loans Committee by Feb. 16, 2008. Applications are available online at http://www.kcpanhel.com. The Missouri Travel Council will offer two $1,000 scholarships to currently enrolled sophomores, juniors or seniors in an accredited college or university in the State of Missouri. Applicants must be pursuing a hospitality related major such as hotel/restaurant management, parks and recreation, etc., must be a current resident of Missouri, and must have a grade point average of at least 3.0. To obtain an application and further qualifications for this scholarship, please stop by the Truman State University Financial Aid office in McClain Hall 103. Deadline for application submission is March 1, 2008. Alpha Phi Omega will be sponsoring the Ugly Man on Campus Competition. Voting took place last week to determine who advances to the pageant. The pageant will take place at 7 p.m. Dec. 6 in Baldwin Auditorium. At the pageant, the audience will vote on a winner of the Ugly Man on Campus competition. Half of the money will go to the Newman Center while the other half will go to a charity preselected by the winner. The pageant will feature performances by University Swingers, Sweet Nothings and Tag Improv. Contact Stephen Barnes at stephen@truman.edu or 314.583.2885 for more information. The Staff Council is sponsoring this event. Contact Kristin Flannigan at kristinf@truman.edu for more information. Truman’s a capella groups will be singing holiday tunes while students enjoy free hot chocolate and rice krispie treats. Students may attend one of two informational meetings this week to find out how to submit their student-produced short film in this film contest. Contact Ginger Daugherty at ged106@truman.edu for more information. The Truman Alumni Association and the Office of Advancement invite December graduates to attend the annual Graduation Pizza Party in their honor. Free pizza, soda and dessert will be available, and all graduates will receive a free gift. Those who cannot attend the event should stop by the Advancement Office in McClain Hall 100 to pick up their free Truman alumni T-shirt. Contact Denise Smith, director of alumni relations, at dlsmith@truman.edu or Greg Xander, alumni relations assistant, at gregx@truman.edu for more information. Thank you to Truman’s faculty, staff, and students for donating more than $58,000. Thank you to students who donated their meals blocks, raising more than $3,500. Thank you to the student organizations who donated money, raising almost $2,000. The United Way would like to thank everyone who contributed to making the Kirksville community a better place. The Department of Public Safety will be providing a shuttle service from the LaPlata train station. A $5 fee is needed for a reservation to be held. Money is due prior to departure. Please pay by noon Dec. 14. The fee may be paid at the Public Safety Building during regular business hours, Monday-Friday, 8 a.m.-5 p.m. 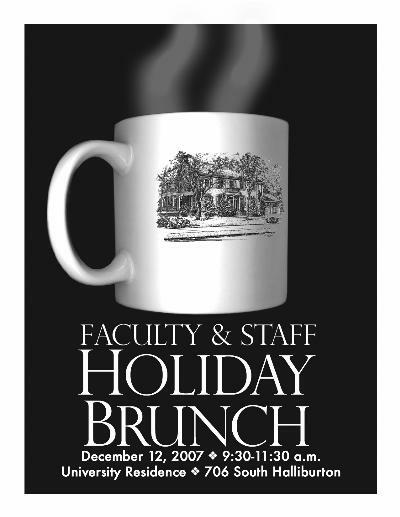 Contact Joyce Mullins at 785.4177 between the hours of 8 a.m.-5 p.m., Monday-Friday, to make reservations. Departure: Meet and load at 9 a.m. Dec. 15 at the Public Safety Building. Return: Bus will pick up students in the evening Jan. 13 in LaPlata at the Amtrak station for return to the Public Safety Building. The Truman State University Student Recreation Center has been approved to be a host site for a YogaFit Teacher Training Level 1 Feb. 9 and 10. YogaFit is a national leader in training and certifications. People who obtain this training/certification will be able to teach yoga anywhere in the United States, upon completion pay ranges from $20-$60 an hour depending on location. If you are currently a fitness trainer, group exercise instructor, in the body/mind health field or simply wish to deepen your yoga practice, you are an excellent candidate for the YogaFit teacher-training. The benefits of the YogaFit program include balance, strength, power and grace as well as maximum stress reduction. Participants will learn correct physical execution; transition; modifications; sequencing; class formatting; effective ways to communicate the body/mind connection; and safe teaching skills for more than 40 poses. Cost includes two days of training by a YogaFit Master Trainer, in-depth and fully illustrated manual, class formats, and a yoga mat. Early-bird registration (reduced fee) is due Jan. 11, 2008. To avoid a late registration fee be sure to register before Feb. 1, 2008. Class capacity is limited to the first 32 people that sign-up. Please stop by the Student Recreation Center office (located on the second floor) for a registration form or more information. Contact Karen Skoch at kbskoch@truman.edu or 785.7739 or visit http://www.yogafit.com for more information. Tickets are no longer available for this performance. For more information, call 785.4016 or visit http://lyceum.truman.edu. The new exhibit in the library gallery, "Study Abroad at Truman," highlights countries where Truman sponsors study abroad programs. The colorful exhibit features flags, currency, books, travel guides and other items from each of these countries. Dec. 4-6 • 7:30 a.m.-2 a.m.
Dec. 7 • 7:30 a.m.-9 p.m.
Dec. 8 • 11 a.m.-9 p.m.
Dec. 9 • 11 a.m.-2 a.m.
Dec. 10-13 • 7 a.m.-2 a.m.
Dec. 14 • 7 a.m.-6 p.m.
Dec. 15 • 10 a.m.-5 p.m.
Bradford Blackburn, assistant professor of music, presented a lecture/performance “The Music of Harry Partch-Corporeality and Musical Gesture” at the 50th national conference of the College Music Society Nov. 18 in Salt Lake City. The lecture/performance was featured as part of the Contemporary Music series. Included in the presentation was a video clip of a performance given by Blackburn, Joshua Baum, a graduate music student from Kansas City, Mo., and Megan Arns (’07) of songs from Harry Partch’s “Eleven Intrusions.” This rare performance of Partch’s music was presented during the 2006 Truman State University New Music Festival and used replica Partch instruments that were designed and built by Blackburn. The College of Arts and Sciences has a vacant work study or scholarship position open beginning January 2008. Applicants must be able to perform office duties as assigned. Duties include answering phone, filing and greeting faculty, students and staff in the office. Please call 785.7200 for information or stop by Ophelia Parrish 1109. Upward Bound (KB 220) has an opening for a tutor/adviser. The position entails mentoring and tutoring college-bound high school students. Review of applications will begin immediately with a plan to fill the position before the end of the semester. More information is available on the Web at http://ub.truman.edu or by calling 785.4244. Homecoming apparel is now on sale until Dec. 7 at discounted prices. Apparel will be available for purchase from 9 a.m.-4 p.m. outside of the Center for Student Involvement located on the lower level of the Student Union Building. The University Art Gallery at Truman State University presents “We Don’t Do Three Dimensions,” the thesis exhibition for BFA/BA candidates Keila Ferree, a senior art major from Nevada, Mo. ; Matt Green, a senior art major from Brookfield, Mo. ; Luis Alvarado, a senior art and Spanish double major from Kirksville, Mo. ; Katie Poland, a senior art major from Defiance, Mo. ; and Erin Fox, a senior art major from Lake Ozark, Mo. In the Spotlight Gallery “A Strong Foundation,” an exhibit of faculty-chosen work from first-year studio foundation students, continues. The Gallery invites the community to a reception at 6 p.m. Dec. 4 to view the works of these exciting emerging artists. The show will be on display from Dec. 4-7. The Psychology Department invites the Truman community to attend the Fall Senior Capstone Research presentations. Nearly 50 senior psychology majors will present posters of their research projects from 1-4 p.m. Dec. 4 in the Student Union Building Activities Room. People may stop by to see the interesting work of Truman students, and learn something about themselves. An apartment manager information session will take place from 7-8 p.m. Dec. 4 in the Ryle Hall Main Lounge. Students who are interested in applying for apartment manager positions for the 2008-2009 school year should attend. This event is sponsored by Residence Life. Contact Emily Haupt at ehaupt@truman.edu or 785.4227 for more information. Student adviser information sessions will occur from 7-8 p.m. Dec. 5-6 in the Ryle Hall Main Lounge. Students who are interested in applying for Student Advisor positions for the 2008-2009 school year should attend one of these sessions. This event is sponsored by Residence Life. Contact Emily Haupt at ehaupt@truman.edu or 785.4227 for more information. A free tobacco cessation class will take place from 8-9 p.m. Dec. 5 in Pershing Building 301. There will be free patches, gum, quit classes and physician consultations. Students, staff and faculty are welcome. Contact the Student Health Center at 785.4182 to sign up. The Global Issues Colloquium will take place at 7 p.m. Dec. 6 in Magruder Hall 2001. Andy Hilgartner will present “How We Learned How to Destroy Planet Earth: Can We Stop?” Hilgartner will show how the currently dominant world culture and Western linguistic discourse leads us to destroy our planet. He will propose new cultural understandings, distinctions and discourses. Contact Julie Lochbaum at lochbaum@truman.edu or 785.4477 for more information. IT Services would like to invite faculty, staff and students to TechBreak at 1:30 p.m. in the Student Union Building Room 320 each Friday. This weekly series is an opportunity to share information about new and existing IT Service offerings. Additional details and the topic schedule can be found at http://its.truman.edu/techbreak. OK Go tickets are still available in the SAB office, located on the first floor of the Student Union Building. Tickets are $5 with a Truman student ID and $10 for general admission. General admission tickets can also be purchased online through http://sab.truman.edu/store. The concert begins at 7 p.m. Dec. 7 in Pershing Arena. Doors will open at 6:15 p.m. Call the SAB office at 785.4722 with any questions. The annual Kirksville Holiday Bird Count will occur Dec. 8. The objective is to keep track of the abundance of bird species that spend the winter in this region. Participants do not need to be experienced bird watchers. For more information, contact Pete Goldman at pgoldman@truman.edu or 785.4632. The Quincy Symphony Chorus, directed by Phyllis Robertson, will present its Christmas Joy Choral Concert at 7:30 p.m. Dec. 8 at the First Union Congregational Church at the corner of 12th & Maine St. in Quincy, Ill. The chorus will perform a variety of traditional Christmas choral works accompanied by pianist Mary Reeve. Admission is free with a Truman ID. 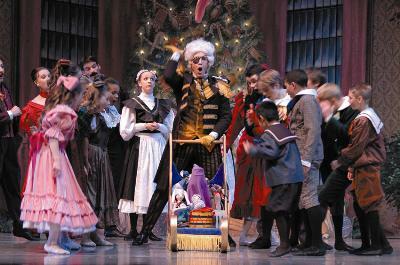 Tickets for others are $15 for adults, $12 for seniors, and free for children 18 and under. Call 217.222.2856 or visit http://www.qsoa.org for more information. The Student Senate Academic Affairs Committee is sponsoring Swapapalooza, a book trade for all students, from 1-5 p.m. Dec. 12 in the Student Union Building Activities Room. Everyone is welcome to trade their books for ones they need for next semester. Contact JoEllen Flanagan at jaf3154@truman.edu for more information. The MLK “READ In” will take place Jan. 24-25 at area Kirksville locations. Students, staff and/or faculty will be volunteering to help share the life and legacy of Martin Luther King Jr. Individuals interested in volunteering for the “READ In” should contact Molly Smith at the SERVE Center by phone at 785.7222 or via e-mail at serve@truman.edu.